With proper maintenance and good driving habits, your Ford F150 will keep running for many years to come. However, it can be a difficult task to work on a F150 at times. As a general rule, you should change your fuel filter every 30,000 miles. When you need to change your fuel filter, keep this process in mind. To begin, you will need a replacement filter and a filter removal tool. The type of tool you will use will vary by the year of your truck. These items can be purchased at your local auto parts store. In addition, you may want to use latex gloves to keep gasoline off of your hands and safety glasses to protect your eyes. It is also important to refrain from smoking while performing maintenance on the fuel system and do not change the fuel filter when the engine is hot. 1.) First, you need to depressurize the lines to keep from spraying gasoline when you remove the lines. 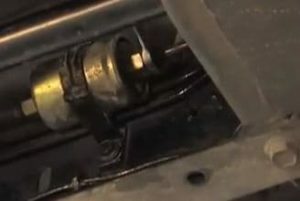 There is a valve on the passenger’s side of the fuel rail on the engine. Depress this valve to release the pressure. 2.) Next, remove the safety clip at the end of the fuel line by squeezing it and unhooking the latch. Your new fuel filter will come with new safety clips however, you can reuse the factory clips if you’d like. 3.) After you’ve removed the safety clip, slide the fuel line away, insert the removal tool and disengage the locking device. 4.) Next, remove the line from the filter. You will now experience some gasoline drainage. You may take the dust cap from the new filter and place it on the old filter to help contain some of the mess. You may raise the fuel line to reduce any leakage from the line as well. 5.) Now, you will remove the line from the inlet side of the fuel filter. Once this is disconnected, the filter is ready to be removed. 6.) Next, take the replacement filter and attach the fuel lines. You will hear and feel a click just as you did when you were removing the lines. 7.) After you attach the lines, re-install the safety clips and you are done. A clean fuel filter is essential to a properly running motor. The fuel filter should be changed as a regular part of your Ford F150 maintenance.